When making fermented vegetables, we often add different kinds or amounts of spices. Their impacts on flavor may be obvious, but what do these spices do at the microbial level? 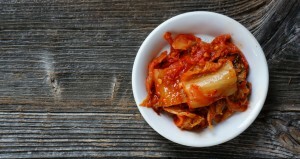 A recent study took a careful look at how the addition of red pepper changes the course of microbial development in kimchi. Henriet et al., International Journal of Food Microbiology. 2014. 191: 36-44. Full text available here.